From YouTube, to Wikipedia, the websites we click on every single day all have one thing in common - HTML & CSS! 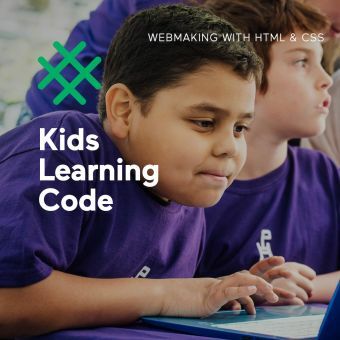 Kids Learning Code is excited to announce an experience that offers learners the opportunity to leverage creativity to build an online web presence. The workshop will focus on reading and writing HTML & CSS using a tool called Mozilla Thimble, an easy-to-use online web making platform that allows for live previewing while coding. In this workshop, learners will learn HTML & CSS basics by hacking pre-existing text, links, images, and videos on various templates, and then use their skills to create their very own webpage from scratch! Fundamental concepts of code, such as divs, classes and ids will enforce organization and prepare learners to continue creating - both at home and at school. Mozilla Thimble also allows for easy sharing, so their awesome webpage can be shared with you, as well as anyone else, with a link! Each Webmaking with HTML & CSS workshop has the same flow, but offers learners the opportunity to create a new website every time! Create a website from scratch! Use Mozilla Webmaking tools to KEEP CODING! This workshop is for kids ages 9-12 year olds + Parent/Guardian. Our workshops are designed to give learning experiences that are fun, engaging, empowering and inspirational. Through hands-on, collaborative, project-based learning, kids end the workshop having built something. This workshop experience is designed to help kids see technology in a whole new light – as a medium for self-expression, and as a means for changing the world.